A Texas high school girl died Tuesday after being flown home in a coma after nearly drowning when a snorkeling tour boat began sinking near Cancun, Mexico, this weekend. The Dallas County Medical Examiner's Office confirmed the death of Lisa Thang Chung, 18. She had been flown to Dallas on an air ambulance along with her parents, said Luis Raymundo Canche, assistant prosecutor for the Mexican state of Quintana Roo. Chung suffered heart and lung failure after nearly drowning Saturday when the catamaran she was aboard sank between Cancun and Isla de Mujeres. "She was so very, very happy, and that's why I gave her a trip to Cancun," Lisa's mother Oanh Chung told CBS News affiliate KTVT. "When she came back, she was ready to go to Baylor, and then she said that's her future." KTVT reports that Chung was in the water and wearing a life jacket when she was struck by a rescue boat. Several other teens who were on the snorkeling expedition told CBS News Early Show anchor Julie Chen that they had had close calls with other boats after they abandoned ship. Jackie Filippi told Chen that she and others had to jump off of the life raft they had taken refuge on after a larger vessel almost collided with them. "It was a bigger boat coming in trying to tow the boat that was sinking," she said. "We were just floating and they came very close to us and we yelled at them, but they didn't move, so we jumped off our lifeboat and swam to just random boaters." Saya Arakawa had a similar experience after jumping into the water and swimming to a lift raft to await help. "But then the boat that was towing our boat that sank, it started getting closer to us," she said. "We were like trying to tell them to move, but they just kind of stared at us. I don't know if they understood us or not. So we had to evacuate from our life raft and just started swimming." 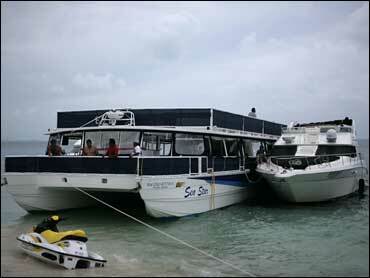 Authorities said they were investigating whether the "Sea Star" catamaran was overloaded. A preliminary report by the port captain said the boat appeared to be carrying 126 people when it is authorized to carry 80. But Sea Star Captain Agustin Cituk said the boat has the capacity to carry 250 people. GradCity spokesman Jason Chute said the snorkeling excursion was part of a package trip organized by the U.S. tourist agency. GradCity has sent 32 chaperones and nearly 500 high school students to Cancun this summer, Chute said. Chute also said the vessel was designed to carry 250, and described it as a 73-foot catamaran built less than six months ago. "It was nowhere near capacity," he said. "We're trying to find out what caused the boat to go under and the series of events following the boat partially sinking," he told The Associated Press on Monday. "We've worked with them before. As I understand, his boat was new, less than six months old, at least that's what we've been told."